We were both interns at Morgan Stanley in Washington, D.C. I needed help with a filing cabinet and the rest is history….! WHAT IS THE OLDEST THING IN YOUR CLOSET? A small Hermes square scarf that my grandfather gave me when I was 8 years old. After that my oldest is piece is probably a Max Mara top I bought in Italy when I was in college. Frank and I went together for 10 days the summer before our senior year. It is still the best vacation I’ve ever been on and I can’t wart with the top! I tend to keep things FOREVER (especially investment pieces)! WHERE IS YOUR WHITE LIVING ROOM SOFA FROM? One Kings Lane! Its sold out but here is a similar style. Ours is also this crypto fabric which has been really helpful repelling stains from the kids (but mostly mine!). ARE YOU CHRISTIAN? JEWISH? ANYTHING? I was raised Roman Catholic. I don’t consider myself to be very religious but I am very spiritual if that makes sense. I believe in God and in Heaven and an after life. Do you have a Spotify playlist? Not yet but its on my list of to-do’s for March! Where is your living room rug from? Its from Safavieh! When we moved in the first thing I wanted to find were rugs for our living room/dining room areas. They’re connected so I knew I wanted to use the same neutral style in both spaces to make it appear larger. I actually found ours on Amazon and took a chance! What a steal! Its since sold out but I was able to find it here and here. Our color is “light gray”. WHAT ARE YOUR OPINIONS ON WEARING A FUR COAT AT THIS TIME OF YEAR? Not sure if this was referring to real fur but I don’t buy real anymore. I have a fur vest (I think fox) that I purchased from a consignment shop 10+ years ago that I still wear because I love it and it wasn’t inexpensive but I wouldn’t purchase it again. Now as for faux fur…YES! It has become so much easier to find amazing faux that you’re not even tempted by the real thing. For men I prefer the look of a shearling coat like this reversible shell. This is my favorite brand these days for faux. Celine Catherine and the style number is 41098. Mine are the Havana blue with tortoise. Here is a similar pair! 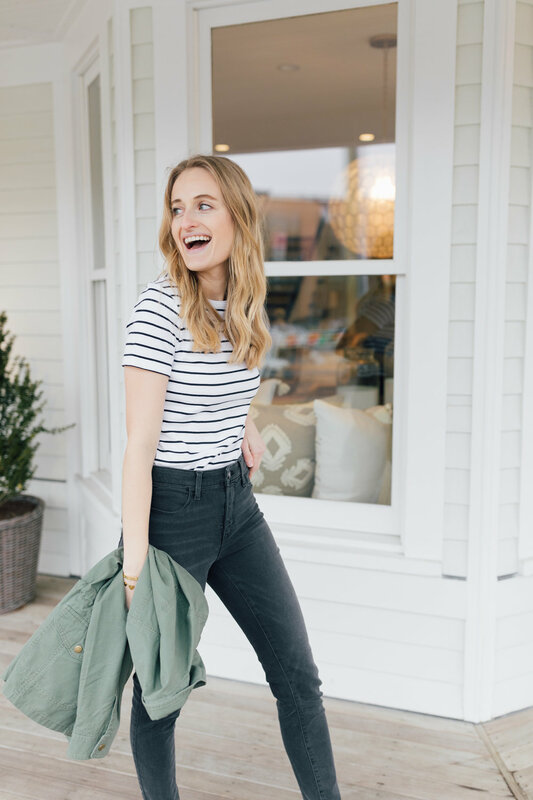 DO YOU HAVE A CAPSULE WARDROBE OF KEY PIECES? Not yet but I’m working on it! Should be on the blog early next month! Three years ago I purchased a winter boot from Stuart Weitzman and still wear them all the time. They really make the best/most comfortable styles in general and I find their cold weather to be no different. I like this one. For rain I recently purchased this pair - love the Chelsea style and the price! HAVE YOU SEEN ANY GOOD BLACK CARDIGANS/COATIGANS OUT THERE? SOMETHING WITH STRUCTURE! I always find that Madewell has a new sweater coat style every season. There are only a few styles left but this black one looks like a classic. Also this one is great (collarless though so a little less structured) and comes in many colors. This will be included in the capsule wardrobe! My all-time favorite white t’s are these and these from Theory. I became addicted to them when I worked there and stocked up right before leaving. They hold up really well and look better overtime in my opinion. For a less expensive version I purchased this one in white during the summer and its a different look but also great quality for the price. Posted on February 21, 2019 by Stephanie Trotta and filed under Wellness, Outfits. Happy long weekend! I would LOVE to hear what everyone has planned for this weekend. Luke is out of school for seven days (insert scared face) so I’m trying to get creative with how we can spend our time over the next week. I’m also feeling just a touch under the weather today - probably fighting off what Luke had last week but also very thankful that I’m not bedridden like he was! I wasn’t going to post sale right now because I feel like I’ve kind of been over sale shopping lately BUT I just had a client ask for a limited roundup of my absolute favorites so I thought I’d share! There actually are some chic wear now and later pieces available and almost all sites will be doing an extra percentage off sale for the holidays weekend. Also insider tip: The Net-A-Porter sale just ended BUT all their inventory will now pop up on their sister discount site The Outnet. Love this jacket! Also, I popped into Zara yesterday to purchase a tank for a client. They have the best basic spandex styles that are great for layering. Recently I had been taking a break from them for two reasons: ONE, I knew I was going to love the new collection, and TWO, I’ve been trying not to shop a ton of Zara because its not available to link on Liketoknowit. Full transparency! Many of my followers will go to LTK to check for items I’m wearing and when they’re not there it can be frustrating. Whelp! I was right that I would love everything and ended up leaving with this cardigan and this camisole. The cardigan was a MUST. Such great quality in person and looks so expensive (although honestly I wish that the Zara price was under 100). Posted on February 15, 2019 by Stephanie Trotta and filed under Outfits. I was recently with a group of moms discussing our relationship with our husbands and tackling the question, “Are we taking care of them?”. At the end of the conversation the consensus was that we all felt we were taking care of our families as a whole, but not specifically the needs of our husbands as an individuals. I think this is a really important topic in an age that is very female focused - Are women being heard? Are women seen as equals? Are our needs being met? While of course the answers to these questions are important, we also don’t want to lose sight of the men in our lives, their feelings, opinions, and needs matter too! Someone brought up the point that they were little boys too once with dreams, hopes, and desires. That really stuck with me as a mom of two boys. I’m putting ever ounce of energy into loving my sons, teaching them, and trying to raise two solid young men who will one day have a family of their own. What would I want their relationship with their spouse to look like? OK why am I bringing this up? …. Well the topic of Valentine’s Day came up and again we all said ok, if we’re looking at it from the man’s perspective, why do they always have to plan the day? What if we were to plan the perfect date for our husbands and ask what they wanted to do? So this year, thats my plan! It was actually really funny…I immediately sent Frank a note asking him and his response was very specific:) I’m going to keep our plans between us as he is very private but it felt good to ask him what he wanted to do for a change! Last year my friend Caitlin from The Picket Fence Project created the cutest DIY Valentine’s. This year we decided to partner and share them with our followers! You can see how to assemble them on my stories today and I will also save them to my highlights. To receive the card template via email, please follow instructions on today’s Instagram post! Order this string and if you don’t have a hole punch here is a link to that too! Posted on February 6, 2019 by Stephanie Trotta and filed under Outfits and tagged Valentine's Day DIY Valentine's Day card tutu Sarah Jessica Parker. This month has been all about investing in fewer, better pieces. From Marie Kondo’s JOY approach to bloggers talking about shopping their own closets, the theme of quality and longevity is everywhere. I was so excited to work on today’s post with a brand that stands for both of these things. Talbots was started over 70 years ago and was founded by a husband and wife duo in New England. They put an ad in The New Yorker! Today they continue to create classic pieces that you can feel good about putting into your closet. JOY! When I prevued the new collection the field jacket was my first choice. I believe that everyone looks good in army green and I love that you can style it back to basically any color. When I was pregnant with Luke I wore a lot of black. Throwing a green field jacket on like this one was the perfect way to break up my look. I’m always on the hunt for the perfect striped tee. Not only is it a wardrobe staple but its one of those pieces you can wear all year round. What I love about this one is the stripe color is a dark indigo and would also pair perfectly with a black leather jacket or blazer. If you’re looking for the more classic vibe, this long sleeved ivory and navy version is perfect. You know that I have a love affair with high-waisted jeans right? These jeggings are amazingly comfortable (I was shocked when I first put them on) and they are the perfect height for a t-shirt tuck. I’m wearing a 2 and find that they run one size bigger than what I’m used to so size down (for reference I’m a 26 in jeans)! 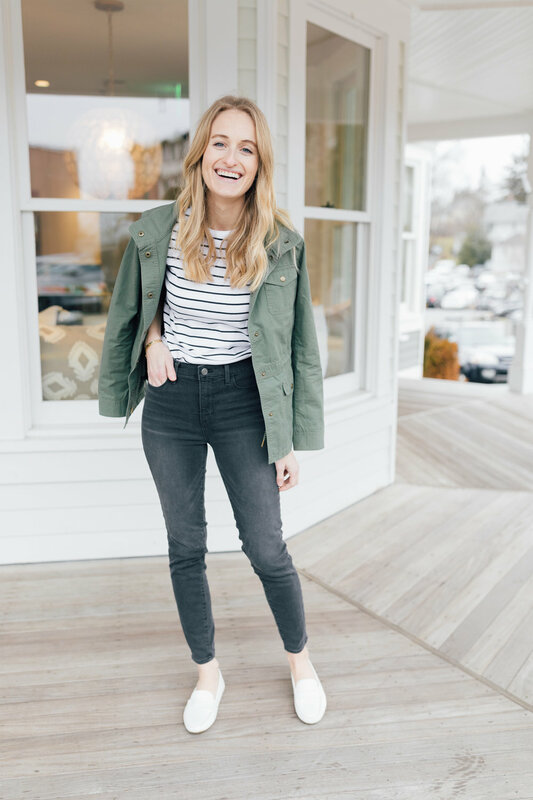 Posted on January 31, 2019 by Stephanie Trotta and filed under Outfits and tagged TALBOTS Army green field jacket striped tee shirt gray jegging jean high waisted ivory driving moccasin loafer. I love wearing silk skirts and luckily for me its been a bit of a trend lately which equals more options. I posted this silk skirt look at the beginning of the season and since I did I’ve probably worn it 10 different times and 5 different ways. I first saw this style online but didn’t order because I thought, “How could it be nice at that price?”. Well I was wrong! Walked into H&M last month and was shocked at the quality (and again at the price) and so excited they had my size. If you don’t see your size keep checking back, I find that people return or exchange and you get a second chance! Here is another style that would be pretty with a black or ivory sweater. I also love this snake style or this burnt orange one paired back to a brown sweater. Posted on January 22, 2019 by Stephanie Trotta and filed under Outfits and tagged midi skirt snake printed silk skirt from H&M vince silk skirt Celine sunglasses blush scarf how to wear a scarf Chloe mini marcie handbag cartier watch Cartier love bracelet. I’ve said this before and I’ll say it again, “mom life” doesn’t have to mean you’re living in spandex everyday. Totally not judging those who do (I get it!) but there are other options:) Below is my simple formula for a chic and still comfortable kid-friendly look. It all starts with a cute coat like this one. Its usually one of the pieces in a closet that my clients will say they’re “saving” for a special occasion. My advice is to ditch the puffer once and a while and feel good in your best coat! A wool wrap coat doesn’t have to break the bank, and I tried rounding up a wide range of price points. Next up, my closet staple the oversized sweater. I love this one and this budget friendly neutral one. My favorite pair of black jeans (probably ever) are these. I have them with the slits but you can also get them without. They’re extremely comfortable and soft and the high waist holds everything in. Note: If you don’t love for your button to be over your belly button, these are not for you! Short story about my sneakers: I recently wore them on stories and someone asked what color they were. I laughed and responded, “I call the color vintage and stained!”. I bought this pair 14 years ago at a second hand shop on M Street in Washington, DC. They told me they were special because they were made the last year that converse still made their sneaks in the US. Fast forward 3 years a puppy and one day I came home to a half eaten shoe. Needless to say I STILL have them and still wear them all the time. I was psyched when I found this pair online because the color seems to be that same vintage creamy tone that mine are as well as the slightly elevated sole for a little extra cushion. You will thank me!!! Posted on January 8, 2019 by Stephanie Trotta and filed under Outfits, Boy Mom and tagged mom life mom style converse sneakers frame jeans Celine sunglasses Chanel wallet on chain wrap coat. Leopard is a neutral. There, I said it. No but really think about it….black, browns, tans, and ivory. NEUTRAL! Someone once told me that blondes should never wear leopard. I then showed him a pic of my forever fashion and style inspiration, Carolyn Bessette Kennedy, case closed:) There is definitely a way to tastefully wear animal prints. To prevent a fashion misstep, I always suggest limiting yourself to one piece at a time and pairing it back to a monochromatic look. For something more casual, I always suggest denim. I can’t wait to wear this coat back to a white tee and jeans in the Spring! If you’re looking for leopard in a different color palette I love this gray version. Also this pale snow leopard style would be perfect for New Year’s Eve over a sparkly dress or a creamy cashmere sweater. Need help styling your animal print? Send me a note! Posted on December 27, 2018 by Stephanie Trotta and filed under Outfits and tagged Tyler boe Leopard Coat Celine Catherine sunglasses gold hoop earrings. This travel blanket scarf is my favorite. So cozy! I purchased this wireless and waterproof speaker for my 15 year old nephew! One of my favorite oils to diffuse in our house - great any time of the year. Here is my diffuser. Honestly its become a routine in our house and someone puts it on every night! My all time favorite interior designer. This coffee table book is on my list! I have this one and love it. Posted on December 20, 2018 by Stephanie Trotta and filed under Outfits. Its here! My favorite sale of the year! Whether you’re shopping for gifts or picking up a few items from your own list, I’ve rounded up some of my favorite must see sales this Thanksgiving week. Now is really the time to get your shopping done and just think, by December 1st you can be done! Well sort of…! Last year my big purchase was this pair of boots and I’m still so happy I got them! I will be updating this sale page for the rest of the week and throughout the weekend so keep checking back for more picks and promotions! White jeans 365 days a year! Love the button detailing on this sweater + how adorable are the crop flair pants paired with it? Love this long-sleeved tee for under $20. Something I always forget to buy but so so happy I have when I have them! You can never have enough cozy drawstring pants! This would be great paired with a black cashmere sweater and sneakers or boots for an elevated “lounge” look. Posted on November 21, 2018 by Stephanie Trotta and filed under Outfits and tagged shopbop serena & lily moda operandi mango madewell holiday shopping black friday. On another note, I’ve started doing some Thanksgiving styling for a few clients and love this dress! Also loving this style. Hope everyone has an awesome weekend! Ours is going to be a combination of work, house projects, birthday and parties! Posted on October 19, 2018 by Stephanie Trotta and filed under Outfits and tagged Doen shop doen dresses floral maxi dresses long hair beach waves hair staud bag staud Britt leather bucket bag shopbop free people Cartier love bracelet. Posted on October 11, 2018 by Stephanie Trotta and filed under Outfits and tagged camel trench coat camel wrap coat theory mango.